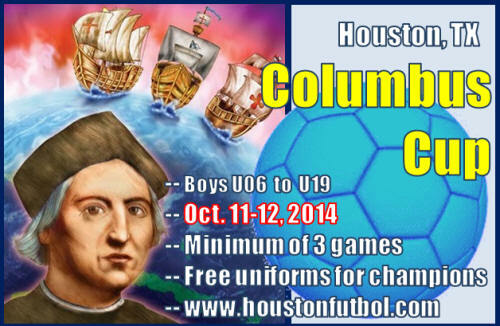 This tournament is designed play a good quality tournament to sharpen your team play for the Fall of 2014. (there are no limits on guest players). Get from 3 to 4 quality games played in a weekend. Please note that in that weekend, there are not scheduled HYSA games. -- Champions of the U08, U09, U10, U12, U14 and U16 divisions will represent our soccer league in the Copa Interliga Houston that will be held on Sunday, November 16th. -- Deadline to register a team is Sunday, October 5, 2014. -- Schedules will be ready on Tuesday, October 7, 2014. Schedules will be ready today Thursday at 6:45 PM.